Every once in a while I get a feeling that I am reading a book at a particularly apt time – sometimes consciously, but more often by chance? or is it? 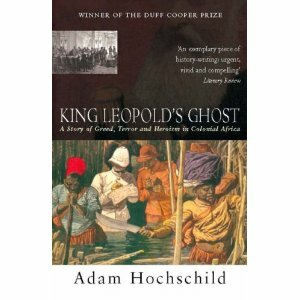 I started reading Adam Hochschild’s account of early colonial rule in the Democratic Rrepublic of the Congo (DRC), King Leopold’s ghost, earlier this month – June 2010 – mainly because it was a choice for the DRC on the Great African Reads group on the goodreads website. Actually it was meant to have been read and discussed in in March and April 2010, but somehow I didn’t clue onto the fact that my workplace library had a copy until it was a little on the late side. But you can never be too late with a book, so here I am a little more than half way through. And then I realised, through listening to the radio – faithful BBC World Service, I will admit – that this week, and indeed today, 30 June is the 5oth anniversary of the independence of the DRC from its colonial power, Belgium. So somehow it feels all the more appropriate to being in the middle of reading Hochschild’s well-written but chilling account of what happened more than a hundred years ago in this ill-fated country, which to this day continues to bear the scars of its heritage, and create new ones, as the BBC’s correspondent in Kinshasa points out. I went to the official launch of the 9th Ghana International Book Fair 2010 at the GNAT Hall in Accra (on 22 June 2010). Although it was a relatively short function – less than an hour and a half – and started only half an hour late, it was in my opinion very much in the traditional mode. There was an audience of maybe 100 to 150, of whom at least half were basic school students in uniform. There were about ten people sitting on the dais, which at the GNAT Hall is quite high up. There was also a banner behind the speakers. As usual those giving the speeches did not address any parts of their speeches to the children present, apart from asking the group from the Osu Children’s Library Fund to come and do a couple of short traditional dances. Of course one of the major stories online quoted the Deputy Minister of Education, Elizabeth Amoah-Tetteh, MP and the representative from the Ministry of Women and Children’s Affairs, Peter Achiaa, and totally ignored comments/speeches made by either the Chairman, who is the owner of SEDCO, a major representative of Pearson books here in Ghana, or that of the Ghana Book Publishers Association President. That of course is typical reporting for many local Ghanaian journalists, especially those working for the state newspapers and/or the Ghana News Agency. Admittedly the coverage in the Ghanaian Times newspaper, which is actually a media partner/sponsor of the Fair, was a little better, and actually talked about what the Fair was about. Plus there was a photo, which always helps. But interestingly enough the headline in this article rather focussed on the revitalisation of the Ghana Library Board rather than the launch of the Book Fair. In neither case was there was a reference to a relevant website, and though posters for the fair were distributed to all present (see above), the brochures for the Fair lacked basic information such contact details, whether phone, fax, email or web. 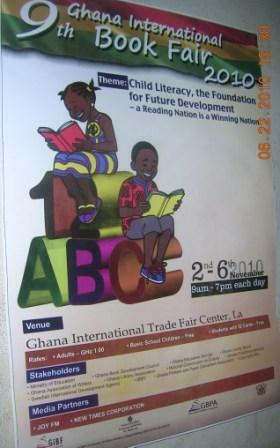 At least the official website for the Ghana International Book Fair does indicate the dates of 2-6 November 2010, and there are contact details, but how would someone find this site? For those interested in such matters, and unable to wait for the full collection in book form, do take a look at the five shortlisted stories for the 2010 Caine Prize. Actually the Caine Prize website generally is full of information relating to upcoming and contemporary African literature. I will not repeat the scanty details of the recent death – on 10 June 2010 – of 81 year old Ferdinand Oyono, the well-known Cameroonian author. I actually heard the news first on the BBC World Service, but couldn’t find any information on the BBC’s website [their search is pretty horrible, I find]. There is a lot in French though, which is not too surprising. And interestingly enough there is a Facebook page devoted to him, which has a fair amount of non-academic information and links about him. I read Houseboy not too long ago, and was surprised that I hadn’t read it earlier, as Oyono definitely seems to have belonged to an earlier generation of African writers, many of whom got published in the Heinemann African Writers’ Series, some titles from which are still available, though unfortunately not all. Of course if you are lucky enough to live in Accra, you can get some of the AWS books at many bookshops, including EPP, Silverbird and Vidya’s, to name a few. Molara Wood is an arts and culture journalist, based in Lagos, who blogs as Wordsbody . Recently she mentioned doing an interview with Ghanaian author, Ama Ata Aidoo, which she mentioned in a post, the highlight of which, in my opinion, a very nice photo of the not-so-young Ghanaian author. Wood also included a link to the full interview , definitely worth reading if you are just a novice to Aidoo’s work. “Imported Ghanaian” advice now online! I mentioned in an earlier post that Alba Sumprim had a recent column in the Daily Dispatch, a Ghanaian newspaper, about her experience in marketing her book. For budding writers she has now put up some of her material on her website, specifically under A book’s journey. Not quite the whole article that I can see, but at least it’s a beginning, and it is entertaining. The Daily Dispatch is one of the few independent newspapers here in Accra which is known for the quality of its columnists – at least in my opinion. One of those I try not to miss is Alba Kunadu Sumprim’s “The imported Ghanaian” which usually comes out on Tuesdays. Not that long ago she wrote a column entitled “So you think you can write?” full of advice to budding authors, much of which was derived from her own experience. And today, she has followed up with one entitled “The real work starts” which is all about publishing, and more importantly marketing, and actually getting your books sold here in Ghana. I wish I could find a copy of the column online, but I don’t think there is – at least I haven’t found one. However, do take a look at Alba’s website, The imported Ghanaian It is pretty bright and lively, and has some of her earlier pieces. And of course, if you want to continue the discussion, you can always contact her via her website.